Teenagers of the world, Dear Teen Me is for you. For everyone who wishes they were on the football team. For everyone who would rather be in the glee club than ever run another lap. For the teens who dream of being far, far away from the small town or big city where they go to school. The prom queens, the theater kids, the band geeks, the bad boys, the good girls, the loners, the stoners, the class presidents, the juvenile delinquents, the jocks and the nerds. The teens who have good days and bad days and sometimes really really really bad days. A group of authors. some famous – some up-and-comers, who care about you. Yesterday my letter to “Dear Teen Me” went live. A lot of connecting and truth mixed with a bit of sass (yeah, that’s didn’t lessen with age) and eye rolling to create something real. 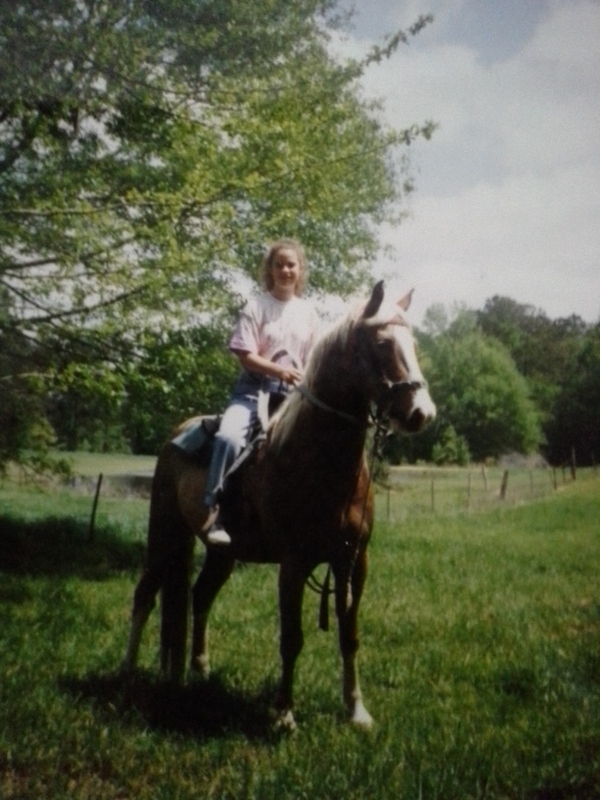 Oh and one great picture of teen me on one of my favorite and most ornery horses. Seriously, during training this horse rolled on me, put me into a tree face first, and tried to dump me in the creek, but I loved Goldie and got him to accept most riders. Just to wet your whistle, here’s that pic for you now. So, go over and read my letter. Let me know what you think. Tell others. Then click around and hear from other amazing authors as they communicate with their teen selves. What are you still doing here? Click click. This entry was posted on Wednesday, July 29th, 2015 at 10:01 am	and tagged with DearTeenMe, Update and posted in Uncategorized. You can follow any responses to this entry through the RSS 2.0 feed.